JAKARTA, Indonesia (AP) — The hardest lap for any swimmer is usually the one coming home. That’s when they have to try their hardest, giving it everything they have to get to the finish. Singapore’s Olympic gold medalist Joseph Schooling is about to discover what that means when he’s not in the competition pool. After spending the last nine years in relative anonymity in the United States, the 23-year-old Schooling is getting ready for the second half of his sporting career back in southeast Asia, knowing he probably won’t be able to walk down the street or go for dinner without being noticed. Schooling is competing at the Asian Games this week, where he has entered in the 50- and 100-meter butterfly, three relays and the 50 freestyle. He will bid to defend his title in the 100 butterfly on Wednesday. Despite leaving Singapore in his teens to chase his dream of winning an Olympic gold medal, the island-state has always been in Schooling’s heart. But so too has Texas, where he has been studying at University and training under the watchful eye of Eddie Reese. Schooling will complete his economics degree later this year before returning to Singapore, but will take back two permanent reminders of his time in the U.S. that changed his life. One is the tattoo on his left shoulder of the University of Texas mascot, the Longhorn, with the words “come and take it” underneath. The other, inked after he won Rio, is the Olympic rings on his right bicep. The Longhorns won the NCAA national title four years in a row while Schooling was on the team and he credits his time there for helping him win the ultimate prize when he beat American great Michael Phelps for the Olympic title in the 100 fly. 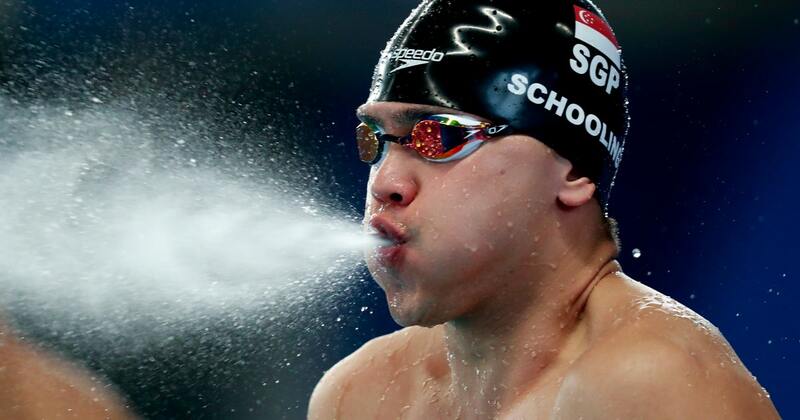 Schooling wants to keep swimming through to the 2024 Olympics in Paris and, although he hasn’t made a final decision on his training plans, he has spent the past few months practicing with Singapore’s new high-performance unit and likes what he sees. Australia’s Stephan Widmer, who helped Libby Lenton and Leisel Jones win Olympic titles, has been appointed performance director at the institute while Gary Tan is the national head coach and Sonya Porter, who has extensive experience coaching in the U.S., is the technical director. Schooling’s biggest challenge could be how to deal with his celebrity status but after he held off Phelps on the biggest final lap of his life to date, he’s confident he can manage.